More than 12 million immigrants to the United States arrived at the Port of New York on Ellis Island; this is why Ellis Island immigration records can be one of the most pivotal resources for your genealogy research. Between 1892 and 1924, immigrants from England, Germany, Ireland and Scandinavian countries arrived at Ellis Island by ship. These immigrants were some of the first people to add to the population of the Unites States. Luckily, ships kept records of all passengers and crew members. How much information you will be able to find out about your ancestor depends on when he or she immigrated. Individuals, who arrived at end of the 19th century, won't have as much information as those who arrived in the 1920s. You can now search Ellis Island immigration records free on the Internet. 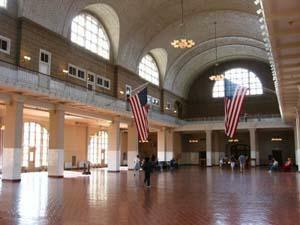 The Ellis Island Foundation, Inc. website has a free search engine for Ellis Island at the Port of New York records. All you need to provide is a last name, approximate year of birth and gender. You can also search by ship and browse the list of passengers, if you are unsure of the search criteria. This site has the most comprehensive results. You will receive all of the information that was recorded when the passenger sailed. If you're looking for a simpler search engine to use and know the passenger's name, you can use Ancestor Hunt. The site has a database of 22.5 million immigrants that sailed to the United States between 1892 and 1924. If you want a website that you can search multiple records, try World Vital Records. They have a specific search engine for Ellis Island at Port of New York arrivals, which includes year of arrival, residence, passenger name and age. If you've found your ancestor in the Ellis Island/Port of New York immigration records, you may be curious to know more about his or her experience. You can learn more about how the Port of New York became one of the most popular ports for immigrants by reading the historical timeline for Ellis Island. You can also read the stories of other historians who searched the immigration records for their ancestry. The stories are captivating. They will motivate you and give you hope in finding your own treasure of information. If you find that one of your ancestors immigrated to the United States before 1930, you may be able to find more information by looking for him or her in the United States Federal Census. Depending on when your ancestor lived in the United States, you will be able to find out more about their personal description, who he or she lived with, where they lived, occupation, health, education, and information about their birth. Once you know where your ancestor lived, you can look for further information from the site FamilySearch, which has vital records microfilmed.